The conversation about climate change is expanding. Experts have long warned that the implications of climate change extend far beyond the Earth’s rising average temperature. In the next century, formerly rare extreme weather events will become more common. As these natural hazards such as heat waves, droughts, and flooding become regular occurrences, they are going to have serious and lasting effects on the ecosystems of the most vulnerable nations. At the COP21 climate conference in Paris, world leaders gathered to discuss strategies on mitigation of greenhouse gas emissions and adaptation to damages already caused. In the early days of the conference, one message was clear: Though they are not responsible for the majority of CO2 emissions, low-income countries will be hit the hardest by the effects of a changing climate. Recent studies by The World Bank and The World Food Programme show that changes in the Earth’s climate will hinder economic development and increase world hunger. Lower crop production, changing landscapes, and shrinking water supplies will intensify global poverty, especially in rural areas reliant upon agriculture. Climate change quickly becomes something that affects more than weather. It is accompanied by fluctuations in economic opportunities, drinking water accessibility, population migrations, livelihoods, physical environments, and political stability within the world’s poorest countries. 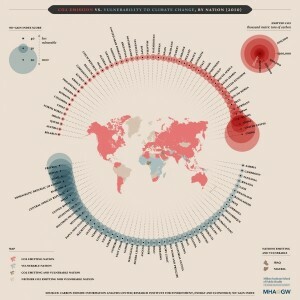 The following data visualization from MHA@GW, the online Master of Health Administration offered through the Milken Institute School of Public Health at the George Washington University, compares the nations that contribute the most CO2 to the nations that are most vulnerable to the impacts of climate change. Many of the nations found to be the most vulnerable, such as Eritrea, Sudan, and Chad, are already predisposed to severe drought. In these areas and others, rising temperatures will contribute to increased water scarcity and decreased water quality. Unless developed countries take accountability for their contribution to climate change, these vulnerable nations will become increasingly susceptible to droughts and contaminated water supplies.